The Polar Bear is a type of marine mammal who loves the cold Arctic temperatures and while this one waits for the Hudson Bay to freeze over in order to catch some ringed seals, he relaxes on the frozen tundra. As cute as this picture is, the polar bear is the largest predator found throughout the world. After many months of conserving energy, this Polar Bear is still in a state of resting as he has been living off his fat reserve for months. Once the Hudson Bay is safe for traveling on ice floes, the Polar Bear will quickly fatten up and eat enough to survive another summer season. 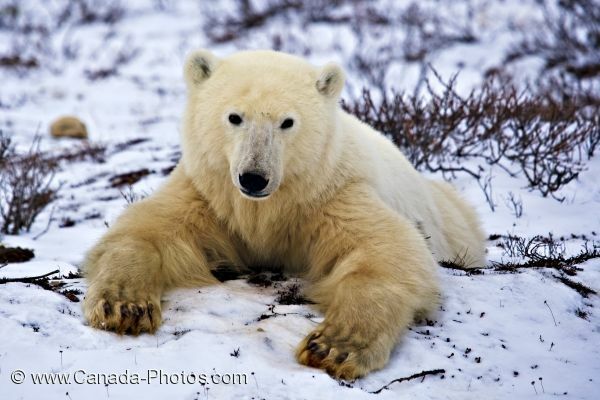 Picture of an Arctic marine mammal, the Polar Bear, resting on the frozen tundra in Churchill, Manitoba in Canada.